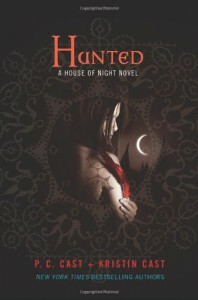 Hunted (House of Night, #5) - P.C. And Kristin Cast - So many books, such little time. I'm starting to get rather irritated with this series. I'm on book five. Yes I've read the previous four. I already know who Zoey's friends are and that Erin and Shaunee are basically twins but not actual twins because 'Erin is a blonde-haired blue-eyed Oklahoma girl and Shaunee is a caramel-coloured easterner of Jamaican descent.' That same explanation has been in every book so far. So if it's in the next one I'm going to flip. Another thing, Zoey is becoming hard to sympathise with due to her being a whore. Every guy she meets, she has to make-out with (Heath, AGAIN! !, Erik AGAIN! !, Stark and even her enemy Kalona) and then spend ages contemplating that maybe the guy she just finished making-out with is the one for her but yet she still likes everybody else. I find her rather pathetic and spineless now and it feels to me that the Cast's are trying to fill up a 439 paged book with a load of random crap. I know this review sounds real negative but that's my honest opinion. I am still going to carry on reading this series but the only thing that is pulling me through is my need to finish something that I've already started and I hope that it will miraculously improve.